Temperatures during the day on Wednesday hovered around freezing and then fell precipitously overnight into the high single digits. I drove to town at twilight on Thursday morning and could make out mist forming over the relatively warm waters of the Susquehanna. Having filled the river channel it spilled into fields of the adjacent floodplain. I was on my way home less than an hour after sunrise and drove the same road along the river hoping that I might watch the morning sun beat back the lingering, misty, tendrils. Although the mists had already retreated to the black waters from whence they had come they had, to my delight, left evidence of their having drifted ashore, stealing among weeds found in fallow strips between harvested fields of corn and soybeans. Some of the evidence is below, hoarfrost on the seed pots of Velvet Leaf, a member of the mallow family. As one might expect, in this age of information, there is a website devoted exclusively to the science of Snow Crystals and Snowflakes. I wasn’t surprised to find this site and was delighted with the level of presentation penned by its author, Professor of Physics, Dr. Kenneth Libbrecht of the California Institute of Technology. When water vapor (as opposed to droplets) freezes it can form either snowflakes or frost depending on the nucleus around which the component ice crystals develop. Particles of atmospheric dust often provide nucleation sites for the formation of snowflakes while vegetation, and a very wide variety of other materials, provide nucleation points for the development of ground frost. I have expressed the opinion before that water is perhaps the most amazing molecule on the planet. 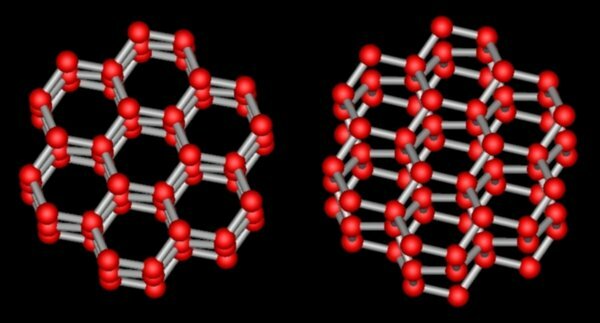 When its vapor freezes to form ice crystals individual molecules coalesce to form a very pretty lattice. The crystals begin at nucleation points and their final shape depends upon the relative growth rate of the eight component crystal facets. What’s fascinating is that if the process of crystal development is perturbed, and the perturbation creates a nonuniformity in the structure of the developing lattice, the irregularity itself may then act as a nucleation point and, in this way, give rise to branches of the growing crystal. 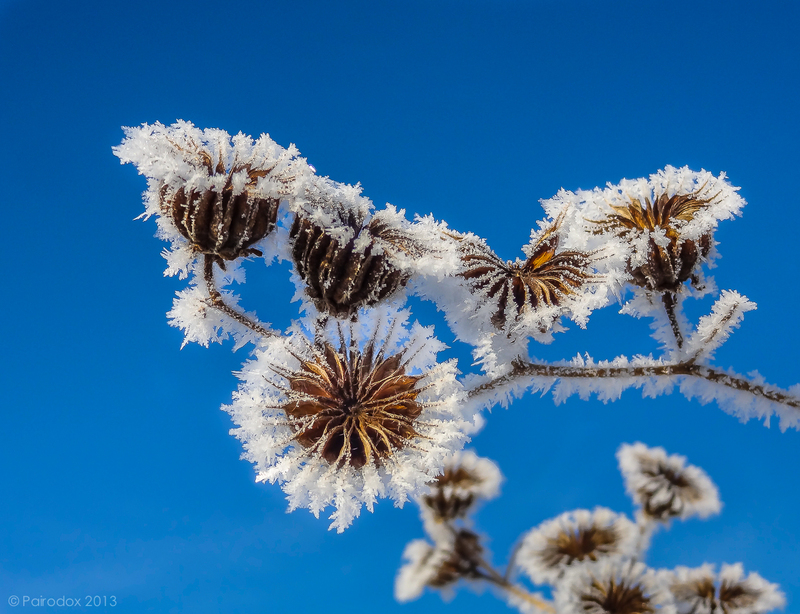 The hoarfrost shown above formed when the Susquehanna river mists (water vapor) enveloped and condensed about the very cold remains of the Velvet Leaf seed pods. Symmetrically arranged tips about the perimeter of the pods acted as points of nucleation. The continued flow of vapor provided raw material for the growing crystals. I hope this little bit of chemistry doesn’t ruin the mystery and beauty of snowflakes and frost for you. For me this understanding makes these most beautiful formations all the more lovely, remarkable, and wondrous. A TRIO OF POSTSCRIPTS: First, I must say something about the title of this post, with thanks to Wikipedia. The term hoar comes from an Old English adjective for showing signs of old age, and is used in this context to refer to the frost which makes trees and bushes look like the white hair of the aged. Second, please take a look at a number of exquisite images of snow crystals captured by Kenneth G. Libbrecht, author of SnowCrystals.com. And, finally, Steve Schwartzman, author of Portraits of Wildflowers has, on more than one occasion posted beautiful images of frost weed. In response to these posts I have remarked that I have always felt deprived for never having the opportunity to photograph such beautiful stuff. I am delighted to observe that I can say that no longer!